Euro 2016-bound Willie Collum should not be refereeing in the top-flight, according to former Hearts and Hibernian midfielder Michael Stewart. The Scottish FA has declined to respond to the remarks, which follow a controversial penalty awarded during Aberdeen's 3-1 defeat in Inverness. "It beggars belief how Willie Collum can still be refereeing at the top level of this game," said Stewart. "There's just far too many of the big decisions he gets wrong." Collum, who has been a Scottish top-flight referee since 2005, has Champions League experience and was in charge of last year's Uefa Super Cup final between Barcelona and Seville. The 37-year-old has also been chosen as one of the 18 referees officiating at the Euro 2016 finals in France this summer. However, Aberdeen manager Derek McInnes believes that Collum was "conned" by Caley Thistle's Ross Draper as the midfielder grimaced after he and Ash Taylor stretched for a loose ball inside the penalty box with the scores tied at 1-1. Football pundit Stewart agreed and told BBC Scotland: "I think anybody who was watching that on the television could see instantly that, yes, the two feet were high, but there was no contact. "Ross Draper fell down in an artificial manner because, if he'd been kicked, he would've spun the other way. "It goes without saying that Ross Draper needs to be bearing some of the brunt of the criticism, but this isn't a case of a different referee every week - the recurring theme is that it's Willie Collum. "This can't carry on. He completely and utterly ruined the game last night." 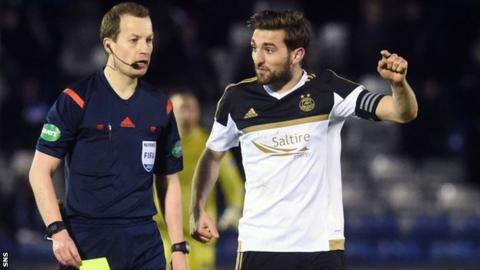 Aberdeen believed they should have been awarded penalties following later challenges on Graeme Shinnie and Taylor. On the choice of Collum for top games in Scotland and in Europe, Stewart said: "It begs the question for me of - who is making these decisions? "Ultimately, there has got to be a level of accountability here." The SFA does not comment on individual referee performances. However, Collum's performances are marked at each game by referee observers. "Everybody is going to make mistakes, we all accept that, but Willie Collum seems to get penalty kicks, big decisions regularly wrong," added Stewart.